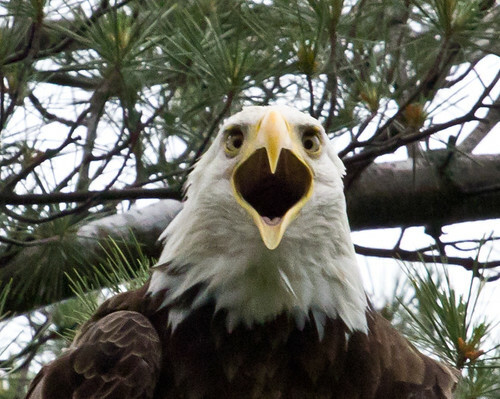 Franklin's general crankiness with regard to eagles may have been over the top, but he was absolutely right that few raptors, including Bald Eagles, have ever been useful in wartime. Birds of prey may have an image of bravery and machismo, but they'd hardly be helpful in the thick of battle. A falcon does serve as the mascot for the US Air Force Academy’s cadet wing. The tradition began in 1955 with a Peregrine Falcon named Mach 1. The Academy built some mews and have maintained from 10 to 15 falcons of a few species ever since—mostly Prairie Falcons, but also white Gyrfalcons. Every year four new cadets are selected to learn falconry, replacing the four graduating falconers. The team of twelve cadets is responsible for the care of all the falcons and for training the Peregrine and Prairie Falcons to perform in flying demonstrations. The falcons kept at the Air Force Academy are bred in captivity, and provide a source of birds for the Academy, for other falconers, and for reintroduction projects. But they're never used in actual missions. Despite the speed, ferociousness, and intelligence of birds of prey, they simply can't help us win wars except by stirring up feelings of power and might. Unwittingly, they’re pretty much like the politicians we call hawks, who stir up the masses to get support for a war, but don’t themselves serve. Ironically, doves have served in the military and actually seen combat. They’ve been wounded in action and honored as heroes for their bravery under fire. One of the most famous of these pigeon heroes was Cher Ami, a male donated to the US Army Signal Corps by British pigeon fanciers. He flew 11 missions during World War I before his final battle, during the Battle of the Argonne in France. On October 3, 1918, more than 500 men of the 77th Infantry Division were trapped in a small depression on the side of a hill, surrounded by enemy soldiers. Their commander sent out several pigeons telling his commanders where they were and how bad the trap was, but one by one, the Germans shot them down. The next day, most of the men had been killed and only one pigeon remained—Cher Ami. In the afternoon the American Artillery started firing at the Germans, and not knowing where the 77th was, they started dropping shells on them, too. 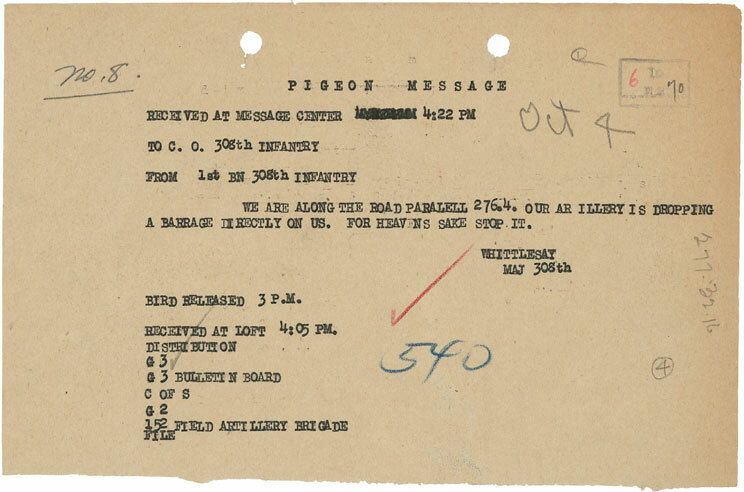 The commander wrote a note: "We are along the road parallel to 276.4. Our own artillery is dropping a barrage directly on us. For heaven's sake, stop it." He attached the message to Cher Ami’s leg and released him. Instantly the Germans started shooting at the little bird, blinding him in one eye, and tearing a hole in his breastbone the size of a quarter. Yet Cher Ami kept flying, higher and higher, until he was out of reach. He flew 25 miles in 25 minutes to his coop and collapsed. The soldier who picked him up saw that one leg had been all but severed—attached by only a few tendons. 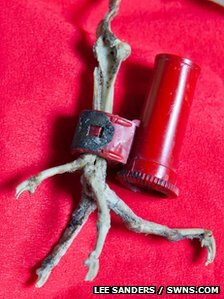 Somehow that leg had become wedged into the hole in the bird’s breast, the tiny canister with the message still attached. Two hundred American soldiers were saved. They managed to save Cher Ami's life, too. The crippled bird was tenderly nurtured for almost a year before finally succumbing. Doves don’t fight—when they’re carrying messages, they’re merely returning to their home coop. They value home and hearth, and just want to be left in peace. No one would ever use a pigeon as a symbol to get people fired up to wage a war in the first place. So ironically, hawks are the birds most likely to promote war while not risking their own lives, while doves, living up to being a symbol of peace, would just as soon avoid war altogether. Yet doves are the ones with the strength and courage to do what needs to be done to actually save the day. I spent 2013 doing what I called my Conservation Big Year, trying to find as many species as I could in the Lower 48. I found myself in a great many grasslands over the continent, searching for birds from prairie chickens and sage grouse to sparrows and plovers. 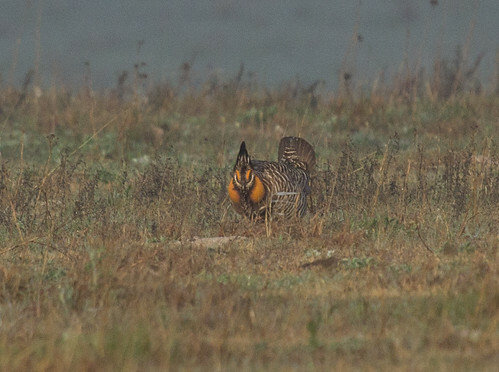 At the end of April in Kansas, I watched one lone male Greater Prairie-Chicken displaying on his lek. No females had been recorded all season, and the only other male on the lek had been killed by a predator the week before. It was cosmically depressing to watch this plucky bird, dancing and booming for over 3 hours without a break, with no hope at all of attracting a mate. That area of Kansas was suffering a crippling drought, and as parched as the landscape was, there were lots of herds of cattle degrading what was left of the sparse vegetation. All year I was seeing critical habitat destroyed by grazing, until in July I reached my breaking point. Just like that, I stopped eating beef for good. Over a decade ago, I found myself driving behind a cattle truck for a 50 mile stretch along I-80 in Nebraska, and one cow stared directly into my eyes the whole time. That was enough to make me stop eating beef for a while. But this time I’m committed. I’ve honored my vow except in two or three awkward situations when I'd have felt bad turning down a special meal someone had prepared. I never did eat much meat, so giving up beef hasn’t been a sacrifice. In many ways it literally was the least I could do, but I had to make some kind of gesture to acknowledge how much birds like that lonely prairie-chicken are suffering as the planet tries to accommodate to our ever swelling human population. My personal issues of not eating beef go beyond the ecological damage that cattle grazing causes. 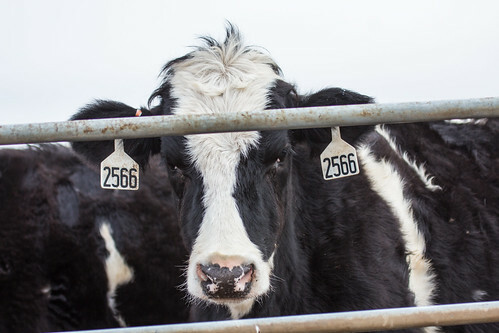 Cows trigger empathy in me. I was never been able to look a cow in the eyes since I went back to eating beef after quitting the one time. But now my conscience is clean. And in December, looking a cow in the eyes made a tangible difference for my final Big Year total. These are Chandler Robbins's binoculars. Talk about being loyal to your optics! This spring, out of the clear blue sky, I was invited to attend the grand unveiling of a new line of binoculars by Zeiss. The original plan was for this to happen in Kenya, but due to security issues, it was moved to Europe at the last minute. 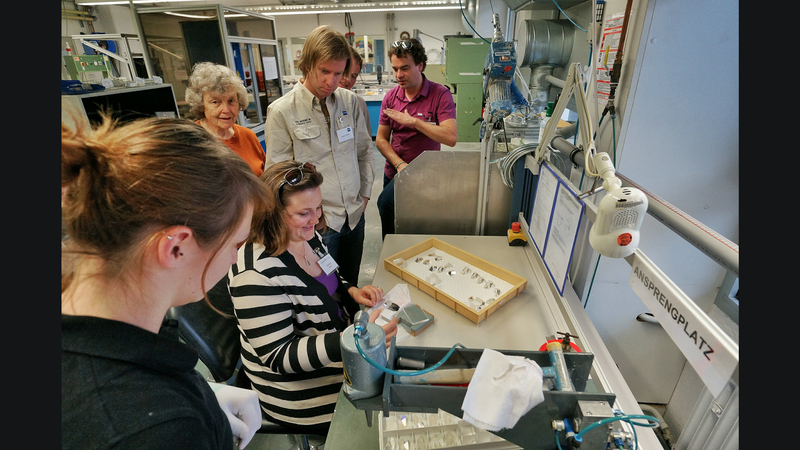 On June 3, a group of 28 or so birders from various places around the globe were brought to the Zeiss plant in Wetzlar, Germany, to learn more about the company, to see their new binoculars for the first time, and to tour the factory where they are made. Swarovski’s innovative EL line, a trendsetter in binoculars since they came out, were created by a design team led by Dr. Gerold Dobler. 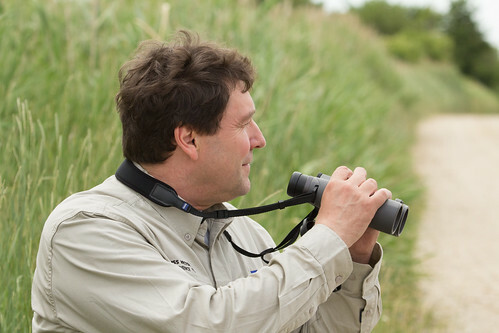 Gerold is an internationally respected birder who knows full well what birders need in binoculars. As an expert in optics, he also understands the limitations and tradeoffs of every design innovation even as he dreams about what ideal binoculars could be. As great as the Swarovski ELs are, and as proud of them as Gerold justifiably is, he quickly thought of ways he could have made them even better, but it was too late. When he was hired at Zeiss, he got the chance to design his dream binoculars—the ones Zeiss is now touting as “the world’s best birding binoculars.” I tend to be pretty skeptical of such sweeping claims, even by a company I’m fond of, but listening to Gerold talk about what he wanted from binoculars and how he set about to achieve it, I started thinking maybe there was something to the hype. 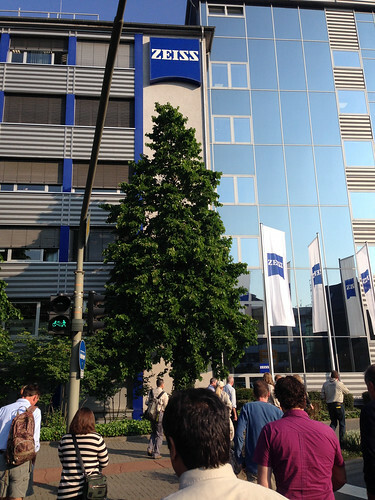 In addition to hearing about Gerold’s design innovations, we learned more about the Zeiss company, which is owned entirely by the Zeiss Foundation. The Foundation mandates that all profits go to ensuring the economic security of the company, social responsibility to the employees, advancement of the interests of precision industries, involvement in community facilities for the good of the working people of Jena, and advancing natural and mathematical science in research and teaching. By their rules, no employee can be compensated more than 10x the compensation of any other employee who has worked for the company for 5 years. I can’t compare Zeiss’s corporate model to any other, because I simply don’t know how Swarovski, Leica, Nikon, or any other optics manufacturer works, but I genuinely liked everything I learned about the Zeiss company at the session. Then they unveiled the new binoculars and let us hold and look through them. They seemed really good, but we were indoors in the city. The only birds we could see were pigeons and sparrows through the window, and while I was holding the binoculars I couldn't even see any of them, so after getting close looks at a wall clock and some of the other birders, I put them down, deciding to reserve judgment until I could get outdoors to see what they were designed to show me. Next we were taken on a tour of the factory. I expected this to be a kind of penance—the price we had to pay before we could actually play with the binoculars. I’d spent one summer working on assembly lines in a noisy, unbearably hot factory outside Chicago. 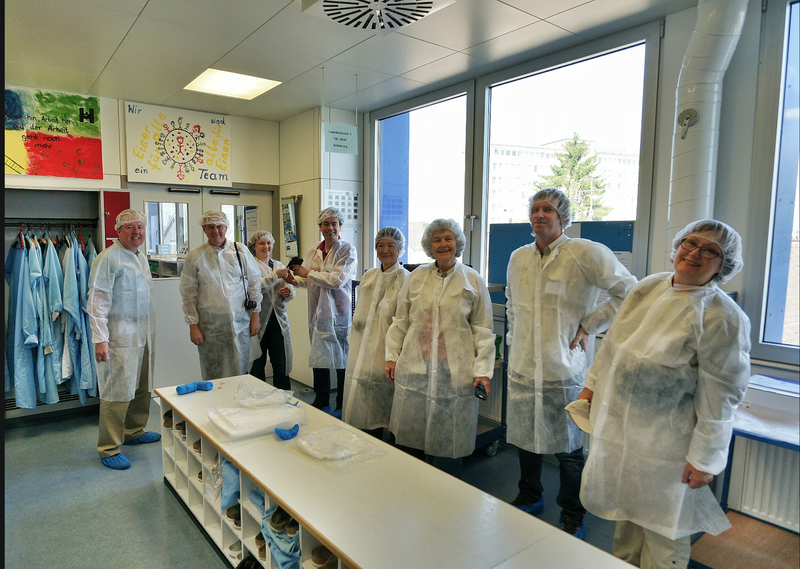 But the tour turned out to be an exciting adventure, blowing my preconceived notions about factories out of the water. The manufacturing process for premium binoculars turns out to be painstaking and time-consuming, with different individuals each responsible for one particular item. One woman was in charge of putting the two prisms together. You can’t use adhesives for this—the binoculars would lose clarity and be literally gummed up. She precisely lined them up together with a thin piece of tissue between, and then simply pulled the tissue out. A few people in our group tried to separate the prisms, but they were tightly secured by their own molecular tension. It seemed like magic! The factory was not designed so much for mass production as for crafting each pair with painstaking precision, each factory worker stationed at a lab table, focused on one element. Zeiss’s premium binoculars all say “Made in Germany,” but after seeing how they’re produced, I think they could more precisely say “Handcrafted with Painstaking and Loving Care in Germany.” Zeiss probably figured that was too long. Our day at the factory was just the start of our adventure. Next, Zeiss flew us to Vienna, and took us to a lovely restaurant not far from a house Beethoven had once lived in. On the outdoor patio, they issued each of us our own pair of the Victory SFs and I started walking around looking for a bird to view through them. I finally found a European Blackbird—an all black version of our robin—and pulled up the binoculars. Not the first Blackbird I saw through the Zeisses--I didn't have my camera! Whoa! Cue the fireworks!! It was love at first sight. 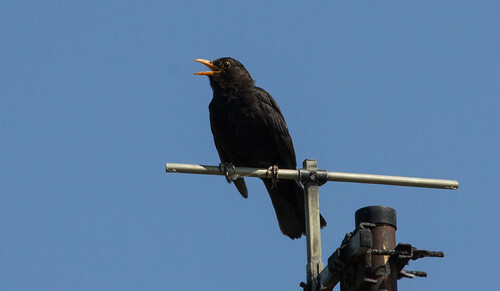 Not of the blackbird—I’d already fallen in love with them in Wetzlar. Pulling those binoculars up to my face was like walking up to a magic window where when you look through, suddenly the glass vanishes and the bird is magically drawn ten times closer to your eyes. The dream binoculars of my imagination are not just a piece of equipment—they’re literal extensions of my eyes, and suddenly, right here in the real world, I was holding a tangible object that lived up to that dream! It felt like there was nothing in the world between me and that bird, its shiny orangey-yellow bill gleaming, its eye sparkling, and every identical black feather perfect and differentiated. Only three times before in my life have I had that jolt of optical magic: on March 2, 1975, when I lifted my first pair of binoculars (Bushnell 7x50 Insta-Focuses) to the very first bird on my lifelist, a chickadee; in 1976 when I first saw a Blackburnian Warbler through Michigan State University’s Leitz binoculars while I was helping lead an ornithology class field trip; and in 1988 when I saw my first bird (a flicker) through my brand new Zeiss Dialyts. I’ve had stunning looks at great birds through many other binoculars, but none had ever captured the magic of those three long-ago experiences before this. Am I exaggerating? No. The whole thrilling experience of being in Europe for the first time in my life certainly cast a special glow on everything for me, but those binoculars were uniquely special. What made them so great? They have a significantly wider field of view than any 10-power binoculars—more than 390 feet at 1000 yards—and the view seemed perfect from edge to edge. Not that I make it a habit to focus my eyes on the edge of any binocular's field of view—we all virtually always watch things in the center. But when I look at anything, my peripheral vision takes in a much wider view than what I'm directly looking at. With that sharp edge-to-edge view, these binoculars gave me that same feeling, like a true extension of my eyes. Edge to edge focusing also makes locating a bird in the first place much faster and easier, and allows easier counting of masses of birds. When I pan across my field of view with binoculars, I have often had a weirdly dizzying, rolling sensation. Not with these. No matter what I did, my view through them seemed just like using my eyes, only better and closer. My blackbird had been singing in a tree obscured by branches. But the moment I caught a glimpse, I got it in focus with barely a movement of the focusing wheel. The so-called "Smart Focus" lived up to the promise. Switching views from storks on distant chimney nests to nearby songbirds was so quick and easy that the focusing contributed to my sensation that these binoculars were an extension of my eyes. I have congenital cataracts, with my view through one eye appreciably dimmer and duller than through the other. Ten-power binoculars seem to exaggerate the difference between them more than lower power glasses. I don’t know if it was the extraordinary light transmission—the new Zeiss binoculars transmit a full 92 percent of available light—or if it was just my imagination, but my views through the 10-x Victory SFs seemed to appreciably lessen this problem for me. I checked on and off for the next three days, closing one eye and then the other, and there honestly didn’t seem to be a noticeable difference at all between my eyes! When I got home, I double-checked with all our other binoculars, and the difference between the eyes was still very apparent, even through my 6-power glasses. I have no clue, optically, what made the new Zeisses better in this regard. I’m open to the idea that it was just my imagination, but it sure looked real. So the clarity, field of view, and brightness in these new binoculars was better than I dreamed it would be. But what I felt was the heft. My index finger automatically rested on the focus knob without having to separate from my other fingers. This is cool, but not the real game-changer. That lies in the complete reconfiguration of the lenses. Gerold Dobler's brilliant idea to take out one of the large, heavy objective lenses and to add ocular lenses not only improved the optics (and in many ways that are beyond my understanding), but put more of the binoculars’ weight near the eyes. That added weight right there seemed to push the glasses slightly against my eyeglasses, holding them in place. Never before did I get the feeling my binoculars were actually helping me hold them steady! Meanwhile, the shift in weight from the objective end made them feel even lighter while I was using them. 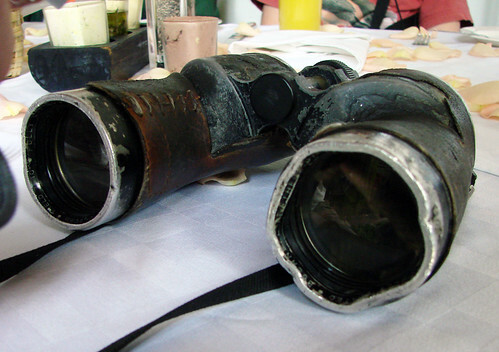 The eyecups weren’t up to snuff, falling out of position too much, but that problem was mentioned at the outset and is being addressed before the binoculars are released for sale. I saw almost a hundred lifers through the Zeiss Victory SFs, including two of the top birds on my “Most Wanted Birds in the Universe” list, the Hoopoe and the Bee-eater. (Number 1, the Cuban Tody, was nowhere to be found.) The birds would have been spectacular through any binoculars, but I don’t think my experience with them would have felt so immediate and intimate. You know those stupid commercials from the 80s about there being "nothing between me and my Calvin Kleins"? It really felt like there was nothing between me and those Hoopoes, and they were way out in a field! The best my camera could do wasn't anything compared to how they looked through the binoculars. I really do want to go to Europe again someday to see these guys up close and personal. I don't know how the Zeiss Victory SFs will stack up when a bunch of really picky birding technology wonks start testing them, but they seemed to me to be the most wonderful binoculars I’ve ever experienced. No matter how hard I struggled to be objective and to find problems with them, the only negative issue I perceived was with the eyecups, which Zeiss is going to fix. After spending three days birding with these binoculars, I can completely understand Gerold Dobler’s pride in his creation, and the company’s willingness to invite a bunch of opinionated birders who write blogs, some who have been loyal users of other brands, on a junket to test them. Zeiss’s confidence wasn’t misplaced—even in private conversations, everyone I talked to seemed to agree these really are the finest binoculars we’d ever used, living up to the company’s hype. I've tested binoculars a lot in the past, and never had trouble giving them back when I was done. This time, I felt bereft. Soon after they’re released, other companies will have taken apart and analyzed the design of the Zeiss Victory SFs and will appropriate many of the same design innovations into their own lines. So birding binoculars will continue to advance. But none of those other companies will be using Zeiss's superb glass, and few if any will match the handcrafted workmanship and quality control Zeiss has justifiably earned a reputation for. 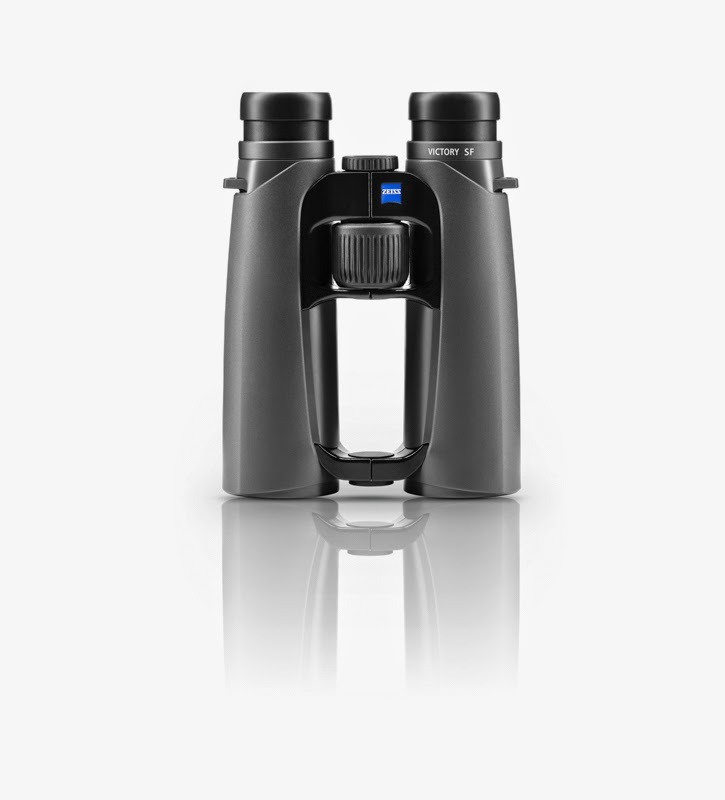 I suspect Zeiss’s Victory SFs will be the world’s finest birding binoculars for years to come. Looks like I'm ready to take the leap and enter into a monogamous relationship that really will last a lifetime. I've fallen in love. 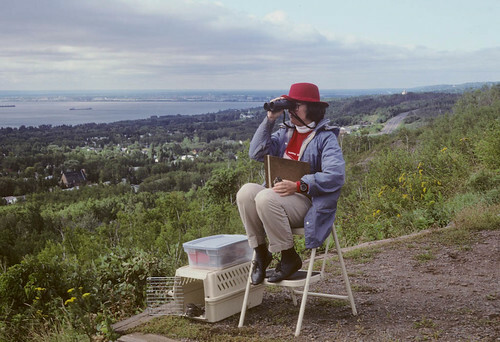 Here I am, counting raptors at Hawk Ridge sometime in the late 80s or early 90s, with my beloved Zeisses. I had an assistant for my counts, my licensed education bird, Fred the Nighthawk (in the carrier). Annie, the young nighthawk on my lap, was being rehabbed for release. She wasn't able to fly yet but kept getting into mischief, so this was the first and the last day she was allowed to tag along when I was counting. When I got my Zeiss Dialyt 10x40 B GAT* binoculars in 1988, they were every bit as wonderful as I thought they’d be. They were way heavier than my tiny Minolta pockets, but I hardly even noticed—they had a nice wide neck strap compared to the skinny string on the pocket binoculars, which despite the lightness cut into my neck, and they felt wonderful in the hand. (Why don't I ever use a harness? I often lead field trips or bump into other birders who want to try my binoculars, making a harness impractical. And now that I almost always have my camera with heavy zoom lens on a shoulder strap, a harness would be even trickier to manage. But most people who do use harnesses swear by them.) The bigger size of my new binoculars added enough light for spectacular viewing. Everything seemed more beautiful through them. I started a Zeiss list, marking off every species I saw through them with a Z. I reached my most yearned-for birding milestones with them, reaching both 500 and 600 on my North American lifelist and 1000 on my world lifelist through them. I thought they’d be my last pair of binoculars for the rest of my life. And they would have been, except for a strange development in 2005 that changed my relationship with optics forever. That year, I got a full-time job writing a blog for a local optics retailer. (I quit the job in 2007 when the local owner sold the company to a huge conglomerate in Omaha.) On my blog, I mostly wrote posts about my fun birding experiences, profiles of birds, and updates on important conservation issues, but I found myself evaluating lots of binoculars, too. My eyes aren’t as discerning as some people’s, but while making direct comparisons between dozens of binoculars, I couldn’t help but start recognizing and being able to evaluate important features such as field of view, depth of field, clarity, close focus, ease of focus, and light transmission. Some of my friends could see color shifts with one brand or another that I couldn’t discern at all, and some didn't understand the weird dizzy feeling I got when panning with some models, but I became fairly proficient at judging a lot of things. Looking through model after model of the newest Zeisses, Swarovskis, Leicas, and premium Nikons, it seemed like in many ways the best premium binoculars were fairly even overall, one model outstripping another in one visual arena but not in others, and the fierce competition seemed to be raising the quality of all models, including mid-range models and even inexpensive ones, to a higher level. I could appreciate that each feature came with definite tradeoffs—you had to give up quick focusing to get really close focusing binoculars, etc. Nevertheless, it was relatively easy to help people make buying choices. 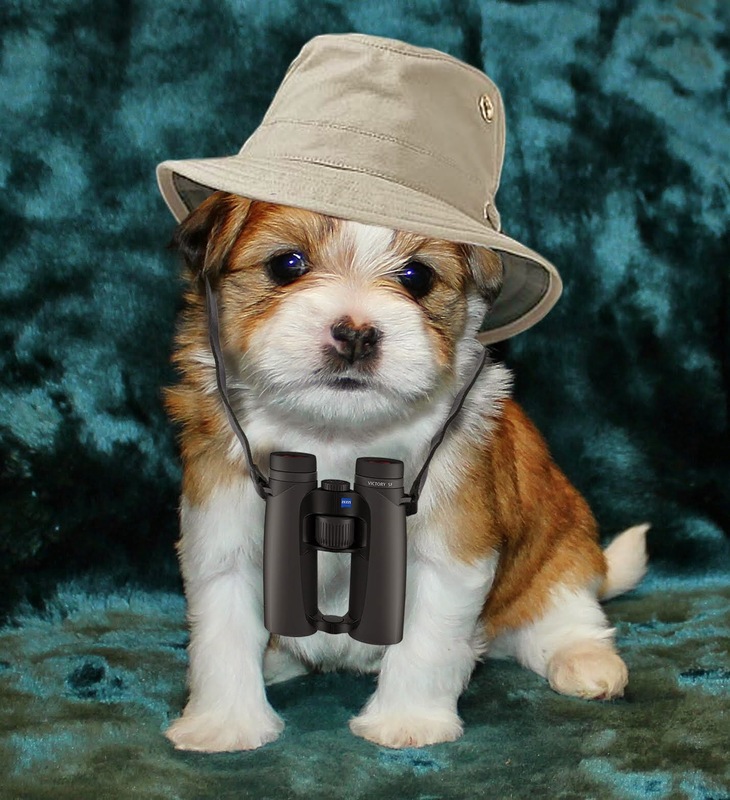 A customer could look through lots of binoculars in his or her price range, maybe eliminating at the outset pairs that had been poorly reviewed by someone they respected. Of the ones the buyer tested, the best decisions were based on both the optics and the ergonomics. If someone spent a lot of time looking at butterflies or dragonflies, they might want really close focusing. If someone wore thick eyeglasses, they’d want longer eye relief than someone who wore close-fitting eyeglasses. That was when adjustable eyecups started being standard for that very reason. Each company’s binoculars felt different in the hand, which was an important consideration. I bought a pair of Leicas on a big discount on the strong recommendation of a few people I trusted, to replace my tragically vanished Zeisses. The Leicas felt heavy and bulky from the start. I figured I'd adapt, the way I’d so easily adapted to my large Zeisses after my tiny pocket binoculars, but the Leicas were simply the wrong binoculars for my hands, and the problem seemed to get worse rather than easing up, so I finally gave up and gave them to a friend. Of the other premium models being sold in the mid-2000s, Nikon’s had an awful smell, like burning tires, that gave me a headache. Swarovskis felt brittle and cold to the touch. The binoculars that seemed most perfect for my purposes were the Zeiss Victory FLs. I couldn’t afford them, even at discount, but got by with the smelly pair of Nikon Premiers I’d been given for free—with time, the smell dissipated, and the optics were definitely premium quality. Meanwhile, I also got a pair of Leupold 6x32s, enjoying the brilliance and tiny size, especially as I started taking my spotting scope everywhere for digiscoping. Meanwhile, I was starting to see a side of optics marketing that I’d never thought about before. At birding festivals, I’d already visited displays for optics manufacturers. All their representatives were very nice and personable. But some were more into hard sells than others, and I simply do not respond well to that. One company's representative told me that ANYONE can afford premium binoculars if they set their priorities right, something I knew from personal experience is not true. I knew full well that the best binoculars are really wonderful, but also that they're beyond the reach of plenty of deserving people. The bad feeling his hard sell gave me probably influenced my recommendations. I met representatives of only two manufacturers while I was at work for the retailer. A guy from Nikon wined and dined the whole staff, taking us to one of Duluth's most expensive restaurants and then playing a lame version of "Who Wants to Be a Millionaire" to get everyone to call out the company name. He gave every one of us, our spouses included, a minimum of $100 in cash prizes, as well as a lot of swag, some expensive, with the company’s logo. The optical quality of Nikon products was of similar quality to that of other companies’ products at similar price points, and we didn’t learn anything special about Nikon that would make it a better choice for customers than any other brand—this was just their way of getting an edge with salespeople so the Nikon name would pop into their heads when customers weren’t sure what brand to buy. I didn’t like that at all. Zeiss’s representative, Stephen Ingraham, also came to Duluth to visit with the company owner once. I got to spend a day birding with him, taking him up to the bog, where we had great looks at a Great Gray and Northern Hawk Owl. Not once did he bring up business with me, nor did he play games trying to influence our sales staff—he seemed to realize that Zeiss products stood on their merits. That soft-sell almost certainly influenced my feelings about the Zeiss brand. I no longer work for an optics company and don't get any sponsorship from optics manufacturers or retailers. But because I often give talks and lead field trips at birding festivals, I’ve run into Steve Ingraham many times since, and always enjoy spending time with him. The Zeiss and Swarovski booths are always my favorites. Steve from Zeiss and Clay Taylor from Swarovski both show great photos and videos they’ve digiscoped using their companies’ optics. 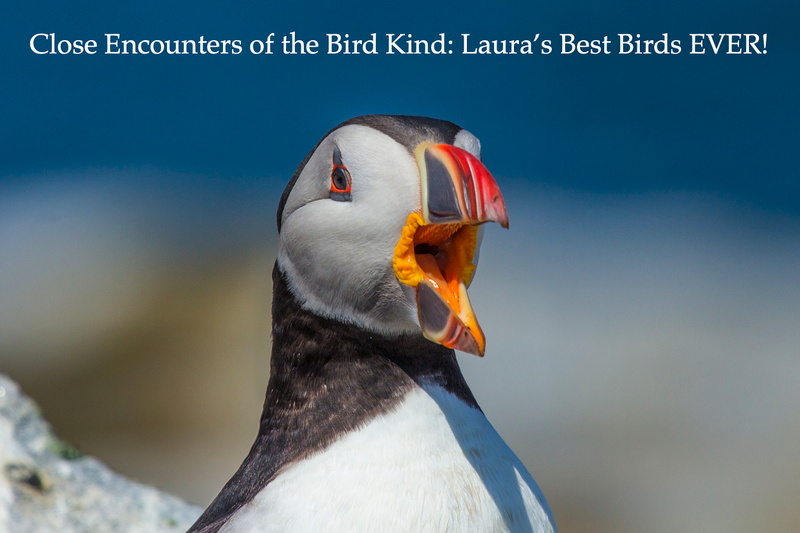 There is perhaps no better test of spotting scope quality than the images you can capture with a camera through them, and no better way to attract birders than with splendid pictures of wonderful birds. Once birders are lured in to one of these booths, they can try out their binoculars and scopes with no sales pitch at all—just honest answers to their questions. 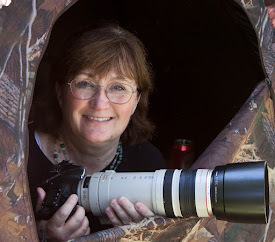 This year Clay and my friend Sharon Stiteler created a series of fun videos showing how they digiscope with their Swarovski products. This series epitomizes the kind of soft sale only possible and successful when the product really does deliver on the kinds of splendid bird images and videos this series highlights. And the educational value of the videos, presented in a creative and fun way, is an indication of Swarovski’s commitment to birders. Last year, Zeiss had a great promotion adding a Duck Stamp to every purchase of Conquest HD binoculars, showing their commitment to the birds we love as well as to us birders. And last year Zeiss released a whole new line of binoculars—their Terras—that retail for about $400, making Zeiss the only company of the top three to offer a mid-range line of binoculars featuring premium, German-made glass. Zeiss apparently realizes that even birders who can’t afford the best models still deserve excellent optics. At this point, it seems from my vantage point and limited experience that Zeiss and Swarovski have been the companies most committed to the birding community. Those two years working for an optics retailer caused a sea change in my attitude toward optics. For the first time, I realized that there really was no “best” binocular—there are too many variables, some of which are at cross-purposes. The balancing of these variables to select a pair is a personal decision, and in virtually all cases, even then there is virtually always more than one “best” choice. 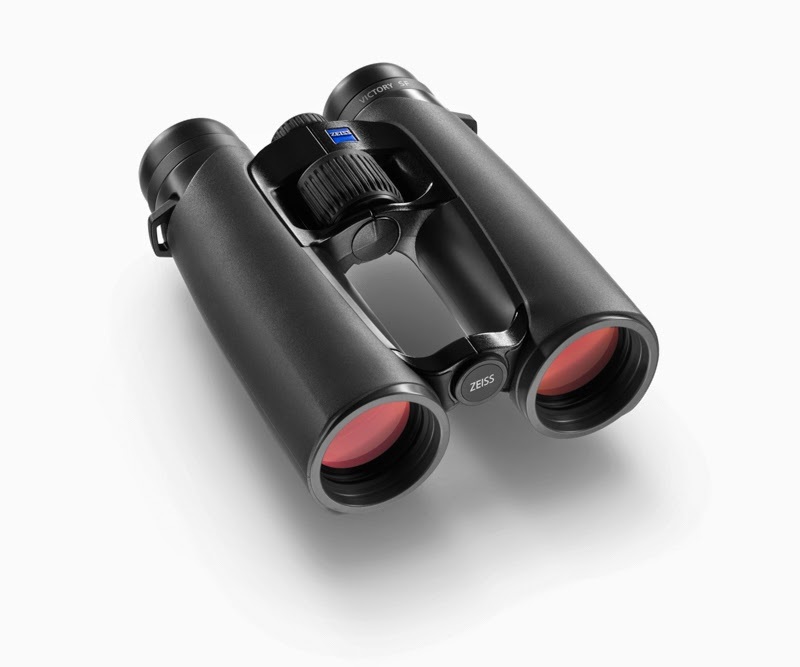 For the past decade or so, the consensus among birders with especially discerning eyes or a keen understanding of technical specifications was that the Swarovski ELs were the best binoculars optically. 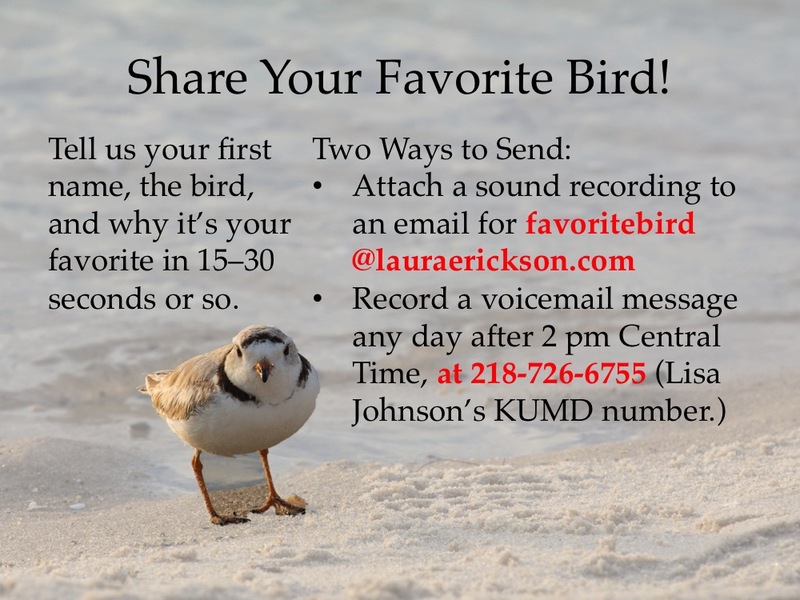 They were developed by a design team headed by an internationally-known birder named Gerold Dobler. I could see that my view through them was at least as good in every way as through the corresponding Zeisses, but they still felt cold and brittle to my hand. I liked the feel of the Zeiss Victory FLs much more, and to my eyes, the view was pretty much equal. Of course, it was all academic—I couldn’t afford to buy either. When customers asked which was better, I told them what the general assessment of experts was as well as my personal impressions. When I left the company in 2007, I had my Nikon Premieres—they were 8-power—and a pair of little 6x32 Leupold Katmais. I wasn't in love with either of them, but I was like a person who's become jaded. What's love got to do with it? In December 2012, just in time for my Conservation Big Year, one of my treasured friends gave me his used pair of 8x32 Zeiss Victory FLs, which have great optics and are wonderfully small and light for wearing around my neck with my camera. I brought them everywhere, and they’ve been pretty much ideal. I saw almost every one of the 593 "countable" species on my Conservation Big Year through them. But last fall one of my friends and I attended at the Monterey Birding Festival in California. 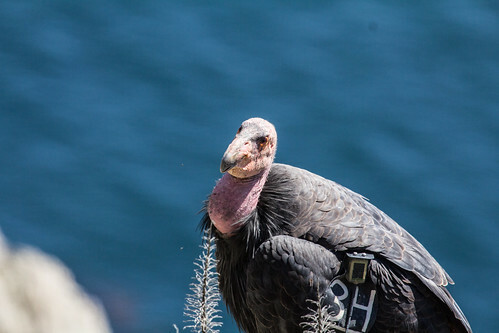 The day before our field trip to Big Sur to see California Condors—a trip where spotting scopes would have been unwieldy—I started worrying about getting good looks if the condors were flying as high as the ones I saw in the Grand Canyon. So on an impulse I bought a 10-power pair of the new Zeiss Terras from one of the festival vendors. Ironically, the condors were mostly perched or flying so close that even 6 power bins would have given spectacular views. But as it turns out, I actually still prefer 10-power glasses for most birding. The only time I wished I hadn't brought them was on a boat trip to Santa Cruz Island. The higher magnification made them harder to hold steady on the boat, and the smaller field of view made it even harder to get them on birds. So now I have my nice wonderfully portable 8x Zeiss Victory FLs and my bulkier but higher-powered 10x Zeiss Terras. My son has my old Nikon Premiers, and I keep my Leupolds and a pair of 6x Vortex binoculars by windows downstairs. I find myself grabbing whichever pair is closest when looking at backyard birds. I usually take my 8x Zeisses when I head out for a day of birding, but sometimes take the 10x ones instead. Ever since working for that optics retailer, I’ve not felt the kind of monogamous love for my binoculars that I felt for my very first pair—my Bushnell Insta-Focuses—nor for my beloved Zeiss Dialyts. It was sad and disillusioning to realize that as useful as binoculars are, the bottom line is that they’re commodities. But something happened this June that was a game changer, and I suddenly found myself in love with a pair of binoculars once again. But that’s a story for another blog entry. When I started birding, my 7x50 Bushnell Insta-Focus binoculars were everything I wanted and more. They got thousands of hours of use—maybe even tens of thousands of hours of use—by me and over a hundred kids during my first two years of teaching. So it’s not too surprising that eventually they got knocked out of alignment. I realized long before that that my binoculars were far from the best. 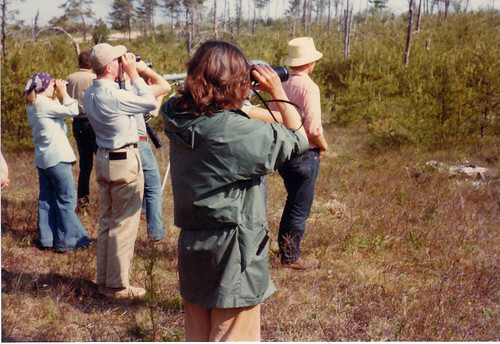 When I’d taken ornithology at Michigan State during the spring of 1976, after birding for a year, I was asked to co-lead a couple of class field trips, and one perk was being allowed to use the Leitz binoculars all the teaching assistants got to use. 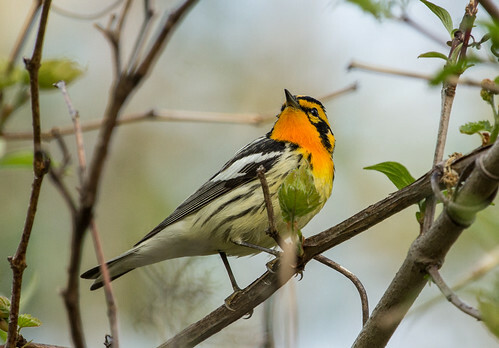 I’ll never forget my first glimpse of a Blackburnian Warbler through them—the clarity! The brilliance! The color! The view took my breath away. Thanks to their superior optics, every bird looked more splendid through them. But since there was no way we could possibly afford premium binoculars when Russ and I were both students, and then when I was teaching in Catholic schools and he was working on his Ph.D., I squirreled away the beautiful memories for a time in the murky future when we could afford them. Meanwhile, I’d come to realize that a spotting scope would be very useful. When Russ was searching for one of those for me, he found a good optics retailer in Chicago—Charles W. Mayher and Son. When my poor binoculars finally needed to be replaced, during my summer vacation in 1979, that’s where we went. We talked to the "Son" of the company name, Carl, who told us that as nice as Leitz binoculars were, in his opinion Zeisses were even better, and he let me compare them in the store. I agreed. They were totally out of reach as far as our bank account went, but now I had something specific to aspire to. For the time being, I got a pair of Minolta 8x25 pocket binoculars. Russ dug up our cancelled check from July 1979 for $141.75—that was a lot of money for us back then but after using my out-of-alignment bins for so long, the new view was great. I never regretted getting them, but now I seriously counsel against getting pocket binoculars for birding—they really don’t let in enough light for birding in the woods, at dawn, or in the evening. Back at the time, my eyes were young, my motivation high, and my pocketbook weak. Switching from 7x to 8x was something of an adjustment. Just a few days after I got my new binoculars, my sister-in-law Jean and I took a road trip out West. Our first stop was Helmer Myre State Park in southern Minnesota. The birds all looked huge through them compared to what I was used to, and I remember being mystified by female Bobolinks—overcompensating for the size difference, I thought briefly that they were weird looking Le Conte’s Sparrows! But I quickly adjusted to the increased magnification, and during the next two weeks, saw a lot of birds, including 37 new lifers, through those Minolta pockets. During the years I was pregnant and with babies and toddlers, my birding travels were curtailed dramatically, though I was as active a local birder as ever. I got my Minnesota list up to 300 doing most of my birding near home. 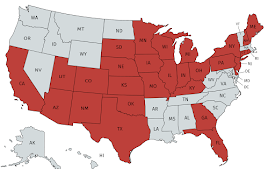 Thanks to all the birding I did close to home back in the 80s, I may be the only person ever to reach 300 on my Minnesota list before I saw a single cardinal in the state. And I did it all using those pocket binoculars. After 1981, I wasn’t teaching anymore, so I was the only one who used them, and they lasted twice as long as the Bushnells did, for the next 9 years, as I brought my lifelist to 480 or so. But I was doing more and more songbird and raptor counting, at Hawk Ridge and from up the shore at the Lakewood Pumping Station. Excellent optics are critical when you’re staring into the blue sky for 8 hours straight, as I realized after coming home with headaches after counting all day. I squirreled away some money from a cover story I did for Wisconsin Trails magazine, and we finally took the leap. On Hawk Ridge Weekend in 1988, I shelled out $800—our family's entire discretionary income for the year--on a pair of Zeiss 10x40 binoculars. And as much as I'd loved my second pair of binoculars, these instantly became The Best Binoculars Ever—a distinction they held until the summer of 2014. 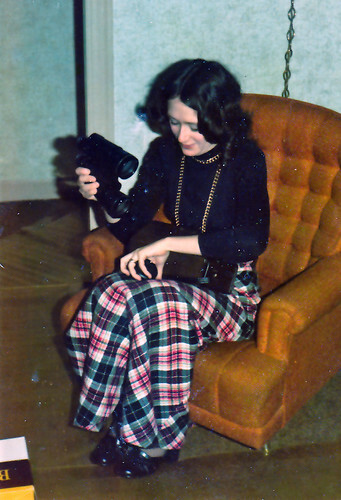 On Christmas Day, 1974, I opened a package from my mother- and father-in-law. As I recall, it was roughly 12 inches square and 4 inches deep—an iconic but generic kind of Christmas present on the outside—too heavy to be clothes, the wrong shape for almost anything I could think of except maybe a couple of really heavy salad plates or a leaded-glass bowl. In other words, it was the kind of Christmas present you just can’t figure out until you open it. And even after I opened it I was a bit mystified. 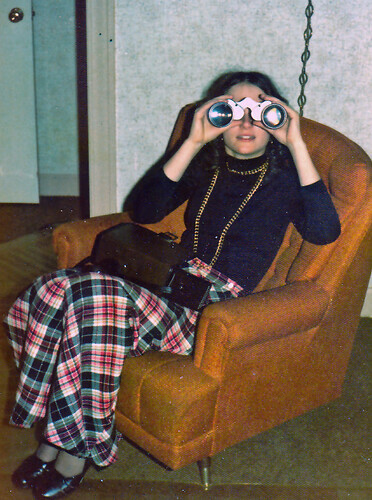 It was a pair of binoculars—something I’d never imagined owning even though I loved birds. Considering that Nancy Kulp was so often cast as a stereotypical nerdy birdwatcher, wouldn't you think I could find ONE photo online that showed her with binoculars?! Well, there's this crappy one from Love That Bob. But my mother said that nowadays (meaning the late 50s or early 60s), the only people who were allowed to own binoculars were peeping toms and spies. Opening my present, I was thrilled to find out that she was wrong. And these binoculars seemed serious indeed. They were Bushnell 7x50 Insta- Focus glasses, making them big and heavy—not some wimpy little pair of opera glasses. Because of the huge objective, they let in a lot of light. And the 7x magnification seemed huge. Considering how impetuous I can be about some things, I’m surprisingly methodical about other things. 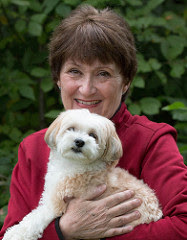 For example, I graduated from Michigan State with Highest Honors in elementary education, after being valedictorian at my high school, but felt utterly unqualified to start teaching grades 4-6 until I’d also attended two years of graduate school, taking a bunch of zoology courses and some environmental education classes, all just so I could be a classroom teacher. 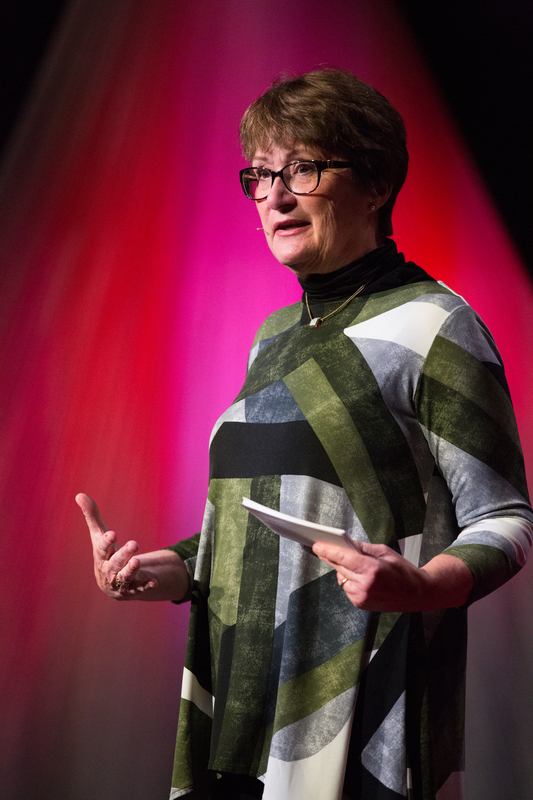 I was scared my students would ask me questions about nature that I’d not have the answers for and not even know how to find the answers, and wanted to feel well prepared before I could take on that responsibility. And in college, before I ever tried to cook or bake anything, I bought The Good Housekeeping Cookbook and read the entire, long introduction. For each recipe I tried, I read every step first, then set out all the ingredients, and followed the directions precisely. In the same manner, when I got that pair of binoculars, along with the Peterson field guide I opened in the next present, I didn’t feel in any way prepared to go outside and start looking at birds. I first read the Peterson guide cover to cover, then bought the Golden guide and read that cover to cover, comparing every illustration of an eastern species to its corresponding illustration in the Peterson guide. Then I read Joe Hickey’s A Guide to Bird Watching cover to cover. A little over two months later, on March 2, I finally took my binoculars out of the box and set out to be a birder. Careful looks at the number one bird on my lifelist, the Black-capped Chickadee, made me love that pair of binoculars in a way I’d never loved any material object in my life. Keeping binoculars on a shelf for a couple of months is a normal thing for most people, but after finally getting mine out, I never put them back. In the last 40 years, I’ve spent more time looking through binoculars than I have looking at television. That spring, I spent hundreds of hours looking at birds. As thrilling as it was seeing new lifers, I stopped for every bird that came in view, new or not, and didn’t stop watching until it flew out of sight. I spent one whole day in a railroad yard watching pigeons, just to study their behavior and flight. These 7x50 binoculars built with 70s materials were heavy, but I didn’t mind—I barely noticed their weight. They were extensions of my eyes, and they opened up a whole world to me that I’d never have seen without them. I picked out my lifer White-tailed Ptarmigan on a Colorado mountain with those binoculars. I saw my first prairie chickens and over 30 species of warblers and my first Le Conte’s Sparrows through those binoculars, which helped me get my lifelist up to 357 before they got knocked out of alignment and I bought a second pair 4 ½ years later. Our first pair of binoculars is, almost literally, an eye opener. I’ve learned with experience that higher quality glasses are important when doing as much birding as I do, but that first pair will always remain dear to my heart.